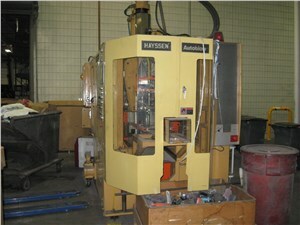 A brand of BW Flexible Systems, Hayssen was founded in 1910 and is today a world leader in monaform plastics forming machinery. Compared to conventional injection or blow molding, Hayssen’s innovative monaforming process requires less resin for equivalent strength. Available in various extruder sizes, accumulator head capabilities, and resin inputs, Hayssen’s single- and dual-cavity blow molders are known for ease of operation and manufacturing precision. Common applications include the production of tubs, cups, vials, jugs, and handleware.